I separate this thread from another thread. "token block signal does not make an intermediate reservation" issue has been fixed. However, I think "Token block signal" is still not working correctly. I updated my testing saved game file. Check this new .sve out. I put some station on that track and I created a new scheduled line as "line (7)" which stops at all stations. See the reservation behavior of "scheduled line (7)"'s case. Some are working correctly, but some are not. Incorrectly example: "B to A" and "B to D"
The front of the train is not reserved in these sections. However, for example (1) and (2), it works correctly when the train passes through these intermediate stations. Thank you for the report. 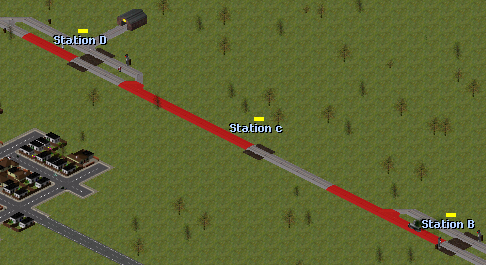 Initial testing shows that the issue when the train is travelling from B to A can be worked around by placing the token block signal at Station B in the station itself rather than beyond the station. In most cases, this will be the correct signalling layout. I will look into the cause of this not working correctly in this somewhat unusual configuration when I have a moment. Thank you for your signal placing advice. Certainly, when traveling from B to A it works properly by placing the signal at the station. However, "B to D" will not work properly even if placing in such way. I made a new saved game, please check it out. Thank you for posting that, and my apologies for the delay. There appears to be a problem with Simutrans-Germany at present such that I cannot download your saved game file. Are you able to upload it anywhere else so that I can test it? Thank you. I am now away from home for the week, without access to the computer on which I have a graphical debugger set up, and so will have to look at this next week now. Thank you for this report. 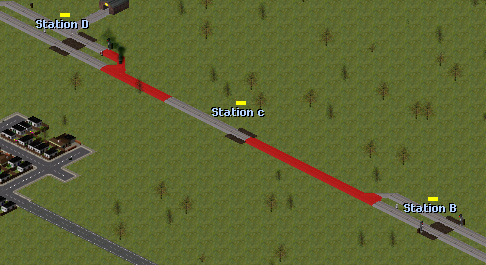 I think that I have now managed to fix the issue in which the train would, as in your animated .GIF, incorrectly unreserve beyond station C when leaving station B bound for station D. I should be grateful if you could re-test and confirm with to-morrow's nightly build when you have a moment. Token block signaling behavior is broken as reported in this thread. However, the action to cancel the reservation of "c to D" has been fixed. Thank you for the report - there was an issue in yesterday's nightly build affecting a number of different signalling systems, which has now been fixed. Can you re-test with the current nightly build to check whether the original error reported in this thread has now been fixed? In the case of line (1), the block reservation of B to A does not be canceled and remain. Thank you for the report and apologies for not having had a chance to look into this earlier. I am afraid that I am having trouble reproducing this with Ranran_signal_testing-2.sve or Ranran_signal_testing-2.sve - are you sure that these are the correct saved games for testing this? That's odd. In my environment this will happen at any time if I change the schedule to line (1). I reconfirmed with build #c6654e6, but it still happens. I have created a new saved game that is occurring. This situation occurs every time the locomotive passes through this place. Thank you for that - I have been able to reproduce it now with the updated saved game - I am not sure what the problem was originally. I have pushed what I think is a fix to this; I should be grateful if you could re-test with to-morrow's nightly build.